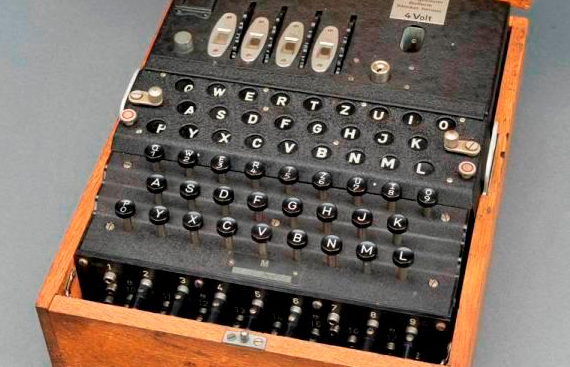 The Enigma is a World War II cryptography machine that was used by German Military members to encode transmissions. The Deutsches Museum suggests that between 100,000 and 200,000 units were made around the lead-up to, and during, the war. The inventor was ostensibly Arthur Scherbius (1878-1929) who filed the patent for an early device, and first used the name "Enigma." Further refinements were made during along the way. The basic elements of the cypher were broken by Polish researchers just before the war, and later, with help of the Poles, the more complex 4 rotor machine was cracked at the historic Bletchley Park facility in Britain. (Movies and fictional accounts often gloss over those facts). This site doesn't attempt to be an authoritative history of the fascinating machine, rather visit this Wikipedia Link for one of the better overviews of everything you'd likely want to know. How many units remain? Surely many were destroyed during the war but between museums and private collectors there are still many about. This list attempts to capture some of those numbers so that interested people can see the units in person. If this effort is really successful, it will hopefully highlight a place for most people to see a machine on their own continent - hopefully not too far away. There is a list of known surviving units - see David Hamer's known locations list here, though it's missing the two units at museum's nearest me (I must email). Are there any other lists? Let me know if you find one. This site was created in 2005, and gets occasional updates and edits. I've enjoyed getting helpful details from readers over the years, and am happy to have gradually expanded and refined the list. Thanks to all the individual museums and enthusiasts around the globe for your emails. Finally, note that this list doesn't purport to be an exhaustive list of all the Enigma machines remaining (not even close!) but rather only tries to list places where anyone can go and see one. Why not see them all and tell me about how many frequent-flyer points you get! See the list by clicking on the tab above. PS. Here's a link to a very neat project that lets you build a modern version of the Enigma based on the popular Arduino system: Mein Enigma. Have some pics of a visit in the War Museum in Luxembourg. If you're interested, pass me your mail and I will send then. You can contact me through my website, just check out Dirk's English blog for the site link. Gonna bookmark you!